When should you take your iPad and when should you take your MacBook? If you use your iOS devices for work on the move, and often find yourself wishing that your tablet came with a built-in physical keyboard so you didn’t have to haul your laptop everywhere, you’re most likely the perfect target audience for M-Edge’s nifty keyboard case — the 10-inch Tablet Universal Stealth Pro Keyboard Case (to use its full and slightly Tom Clancy-sounding name). 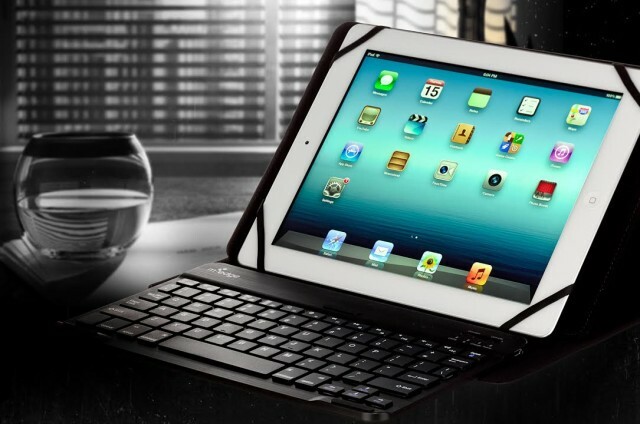 A universal keyboard case compatible with 7” and 10” tablets (so basically the iPad Air and iPad mini), featuring a detachable Bluetooth keyboard which transforms the prospect of typing on your iPad. M-Edge’s “patent-pending GripTrack™ technology” additionally allows you to angle your tablet in various different positions. The durable case itself feels high quality, with an attractively slim profile and a smooth soft-leather exterior. Connecting the keyboard via Bluetooth is seamless, and the combination of keyboard and being able to arrange the iPad at a combination of different standing positions really does lead to a qualitative difference in how you’ll use the iPad. Should Apple go the whole hog and integrate something like this into future generation iPads? Possibly not, but there were several times over the past month when I took my iPad with keyboard to places I normally would have to lug my MacBook along to. The rubber straps holding your iPad in place work well, and the magnetic snap mechanism is pretty satisfying, too. It’s not easy to use it on your lap, it can be a bit heavy, and the keyboard doesn’t have the same high quality feel you’d get from Apple’s own-brand keyboards. The price is a little on the steep side also — something that is a perennial bugbear with Apple accessories. One of the nicer cases we’ve come across for iPad. It’s high quality and does genuinely change the way you interact with your tablet. The price may prove off-putting for some, though.